Getting fast money during emergencies may be difficult and obtaining a loan from banks may be a real challenge, given the extensive paperwork, tightened loan criteria and lengthy approval time. In contrast to traditional lenders, reliable online lenders come handy in situations when you need instant money with no credit checks run and no loan security asked. 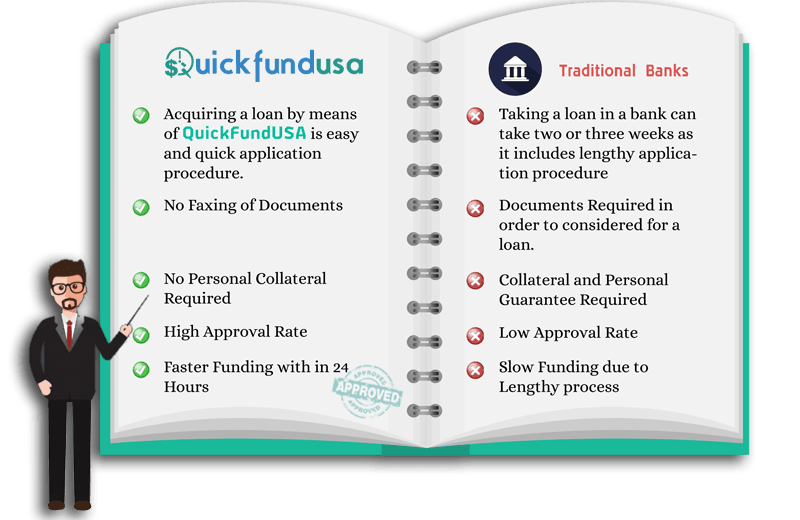 QuickFundUSA is one such trusted direct lender loan company that provides you with legit online loans no credit check over a safe and secure online platform. In addition, as an unsecured installment loans direct lender, we give you the power to choose larger repayments over short time or smaller repayments over longer time. We give you the much-needed flexibility to decide the loan amount as per your need and customize the repayment schedule in accordance with your affordability. What makes QuickFundUSA a Better Choice for Legitimate Online Installment Loans? Thus, no fax loans from direct lenders, such as QuickFundUSA, is a smarter alternative to payday loans. We understand your urgent cash needs better and hence offer quick installment loans with greater ease. Our experienced and skilled customer support, besides being available for you round the clock, also provides you a clear and unbiased understanding of our lending terms and conditions. Installment Loan Direct Lenders - No Bluff. Just Genuine Stuff! QuickFundUSA promotes simplicity, convenience and transparency in its lending process. Hence our simple and easy to meet loan criteria; upfront rates and fees with no hidden costs or extra costs; no collateral needed, as we offer unsecured installment loans; and paperless process with zero documentation. As a licensed lender, we abide by all the applicable federal laws to provide you legit online installment loans. Our 24/7 loan application is completely online and free. A quick understanding of our online installment loans and the lending process. Easy to qualify and quick to get cash up to $1000. Safe and secure online login for complete data privacy. We are a law-abiding lender, we do not charge anything extra than what the law allows. Contact our customer care team now to know more about our instant cash advance loans.